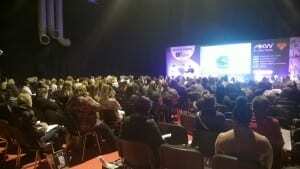 This year’s Occupational Therapy show is now over, but will be remembered as the best one yet! The show took part over two days at Birmingham’s NEC, with even more activities and tasks for OTs to get involved in than ever, as well as learning about new ways to care for their clients. This year we came back bigger and better; our Super OT Selfie Station also made a return. Displaying a dementia friendly bathroom, stylish accessible kitchen and our AKW SmartCare Plus electric shower. This year we had a few extra surprises – like our Super OT Snapchat filter, as well as our beloved Super OT T-shirts. because we couldn’t fit you all in last year!). As the education partners of the show, we worked alongside Adam to create the new session “Visual Impairment & The Home Environment: Supporting Occupational performance”. If you couldn’t make it to this year’s show, missed the talk or you would like to just simply watch it again, we have you covered! Click here to watch Adam Ferry’s presentation. 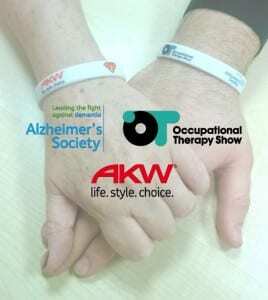 AKW partnered with the Alzheimer’s Society and Dementia Friends for the show this year in aid to raise money for the charities. We had introduced #SuperOT Charity Wristbands, which were available throughout the duration of the show in return for a small donation for a brilliant cause. A few weeks back, we held a competition whereby you could have your name on the red carpet (just like the Hollywood walk of fame). All you had to do to feature on the carpet was submit your favourite OT quote fact or statistic. The winners then had their quote on the carpet along with their names. You can see some of the photos and the winners here! Overall, there is no doubt the OT Show keeps improving year after year, this is most certainly down to the hard work of the exhibitors, the team at CloserStill Media and of course the thousands of OT’s that attended, presented and contributed. Thank you to all who visited our stand and learnt more about our adapted bathrooms, accessible kitchens and daily living products. Lastly we are very grateful to all who donated to the Alzheimer’s society and signed up to be a Dementia Friend, we felt the collaboration between Alzheimer’s society, The Occupational Therapy Show and AKW was a roaring success.